“I never thought I needed it” is a common phrase made by first time users of the beautiful Japanese decorative strip. 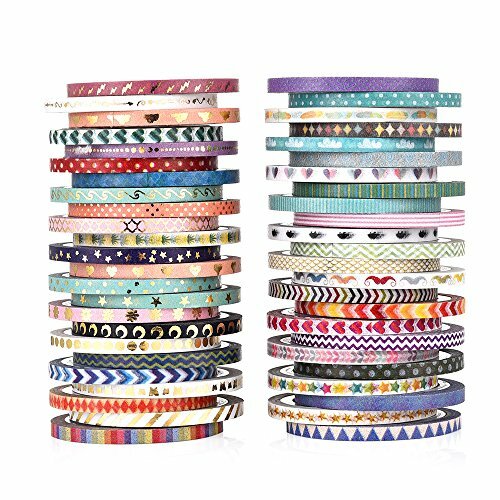 Whether discovered through well researched inquiry or serendipitous ventures, washi tape instantaneously captivates many and is almost immediately adopted into their routine products. Washi is a traditional style of Japanese paper; the word washi comes from the word wa meaning Japanese’ and shi meaning paper. Over the years, people have developed and adopted numerous ways to use Washi Tape. Miliko’s washi tape is made of the highest quality material with well-orchestrated techniques. It is multi-purpose and will not damage your wall, paper or furniture because it leaves no residue behind. Its unique design is good for decorations and also makes it functional. It is packaged is a well-sealed transparent cylinder and as an added bonus would make a perfect gift for people who enjoy journals. This tape hosts a set of 8 uniquely designed 10m (32ft) tapes per pack, it includes Two 30mm wide tapes, four 14mm wide tapes and 8mm wide Washi tapes. It comes with a weight of 4.6 ounces and the shipping weight is also the same. Satisfaction is guaranteed with every purchase. It is very beautiful and looks lovely in a decorative setup, especially for journal lovers and users, it even has the days of the week, months, weather and dates! Its design incorporates various shapes and patterns making its uses multiple. It leaves no residue on your wall paper or furniture. Has 8 uniquely designed 10m tapes per pack, so there’s sufficient for use. After a while it loses its adhesive. 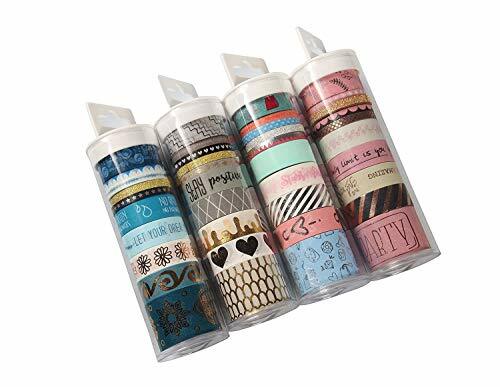 Loe Ts-Washi Tape is a set of 40 rolls of decorative masking tape, it is particularly useful for DIY crafts, Scrap booking, Day Planners, Bullet Journals, and Gift Wrapping. 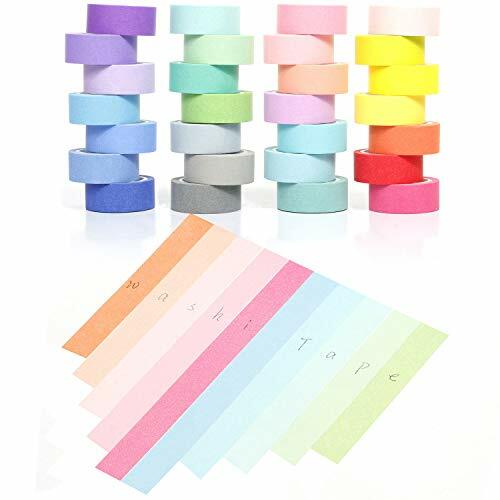 This tape makes for a useful tool in transforming things like cardboard letters into personalized decorations with colorful stripes. Post cards and posters get the best treatment when framed with the Loe Ts Washi Tape, turning Generic tags into unforgettable gift trimmings. Its versatility and diverse color and pattern combination makes it particularly unique and as an added bonus, the rolls have inspiring quoted words written on them. It turns everyday mundane insulation tasks into decorative opportunities e.g. you can use it to keep your surge protector organized with decorated washi stripes. Its quality is unique in that it sticks to almost any surface and at the same time doesn’t leave residues when removed. Durable and won’t lose adhesiveness quickly. 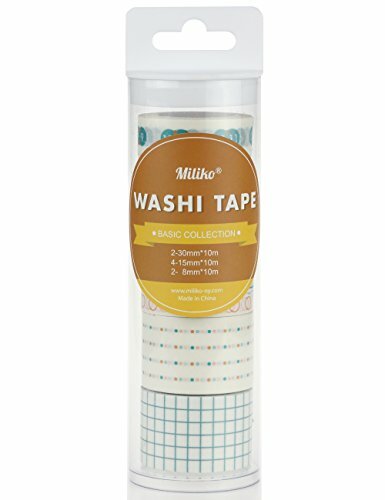 It’s not as lengthy as other one like the Miliko with each roll being 3m long compared to the 10m length of the Miliko washi tape. The colors may differ from the actual package. The Modern and vintage washi collection is comprised of 20 premium decorative sets. It includes 7 gold foil washi tape each a 10m long roll. It is ideal for scrapbooks, DIY crafts, cards of kinds, Journals, planners, wrapping gifts etc. More than most washi, this particular washi creates room for your creativity to soar. Whether you’re working on a personal journal or basic decorations, the Modern and Vintage Washi is ideal. With the Modern-and-Vintage Washi Tape, you can brighten up and color to just about anything you have, you can personalize just about anything. The beauty about this Tape is that if at all you’re not satisfied, the makers of it offer you the opportunity to call them so that your queries can be rectified with no extra cost. You don’t have to worry about running out of tape! The length of each is 10m (32.8ft) each giving it (656ft) in total. It leaves no residue behind when removed hence it doesn’t damage surfaces. Can stick to almost any surface making its use range wider with diverse materials. Can be repositioned easily if the initial position wasn’t pleasant or the outcome was not the desired one when sticking. As it unfolds, it begins to lose its thickness, not quickly though but gradually making it nigh redundant as it nears it completion. Though its adhesiveness is quite good, I think it could have been better as its starts to lose it also as it nears its completion. Though highly useful, the Popiwashi is more fun centered and is meant to give you enjoyment as you use it. Whether you’re looking to have some quality time with your little ones, younger siblings or friends, the Popiwash is ideal for you. 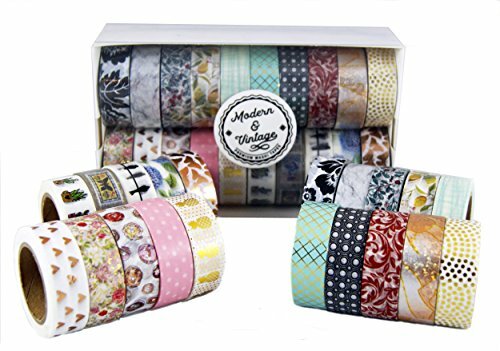 With 24 rolls of washi tape inside the box, it contains colorful, decorative and fun masking tape for multipurpose including DIY crafts, Journals, Planners, Kids art projects, Gift wrapping etc. Each roll of adhesive tape measures 0.59 inches wide and 13.1ft long boxed in a clear sliding cover making for easy storage among your collections. It is great for both adults and kids alike. The designs include rainbow polka dots, birds on a line, cute panda pictures, kissing swan, elegant flowers etc. Its stand out feature agreeable by most users is definitely the variety of designs made available in the package therefore increasing your options for usage. It’s fun to use, especially with family and friends. It’s consistent in adhesiveness, unlike some other Washi tape, the Popiwash sticks to the end. You will not encounter problems even as the rolls nears completion. It is well assorted and priced very well. Its quality is not very good in terms of repositioning in that it leaves residues. It’s not very lengthy, so its prone to run out faster than most Washi tape. The Yukuntang Washi Tape is a decorative masking washi tape primarily ideal for DIY crafts and book designs. It is comprised of 28 rolls of different colors, with 14 rolls which are warm-toned and the other 14 are in cold toned. Each roll is 15mm in width and 5m in length. 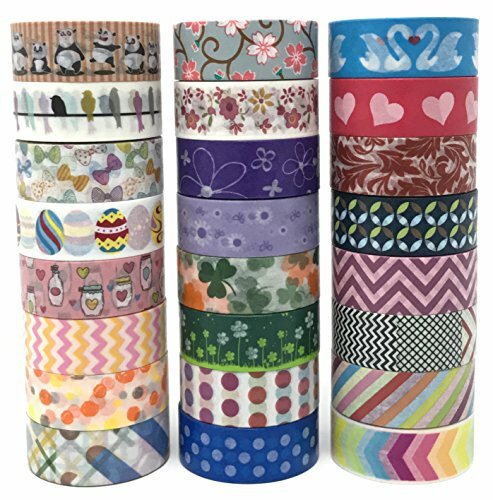 The Tape brings quality to the table thus all the tapes all the Washi tapes are evenly sized and are of great quality. They have very bright and vibrant colors which make their texture a little bit more glossy than other Washi Tape. It comes with a satisfaction guarantee promise. They are easy to use remove and tear off applied surfaces. It doesn’t leave residues making it easily repositionable if the need to do so arises. They can be applied on most surfaces without difficulty making the decorative options multiple. It is well balanced, not too thick or too thin and with the right amount of adhesiveness. Its uses are limited to mostly DIY crafts and book designs; it doesn’t fare well with other uses. You can’t write on them clearly with a pen or pencil, markers can be used but they won’t be efficient. 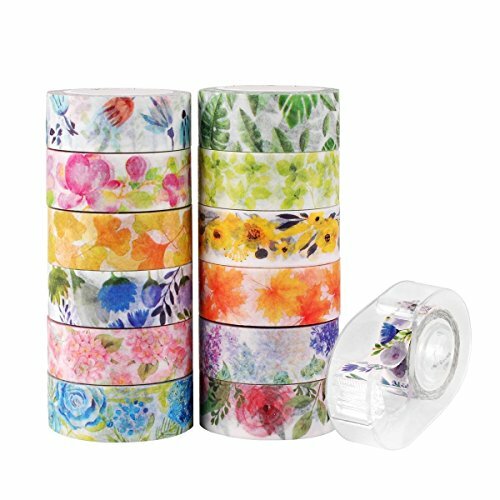 The Knaid-Floral Washi-tape is made of rice paper, it is slightly transparent, flexible and easy to use. It comes with 12 vibrant floral designs with a width of 15mm (0.59inch). Though it is a floral based design, it amazingly has no duplicate with each design branded with uniqueness. people have even used it to fix wall cracks. It’s easy to use, you stick it, remove it, tear it etc. with great ease. It is durable, it won’t wear off surfaces quickly. Ninico Washi tape creates fun and chic products for both adults and children. It contains 60 rolls of glitter washi tape. Ideal for DIY dcor and crafts, scrapbooking and party supplies. This Tape inspires and empowers creativity in people who love DIYs to not only get things done but to also have fun while doing it. With great 60 great designs and different vibrant bright colors, the Ninico Washi Tape comes with 10 solid colors and 50 different patterns. With 60 rolls of Washi tape, Ninico has a lot to go around. It has great dimensions, with 15mm in width and 3m in length per roll. It is easily repositioned and won’t leave residue. Most Glitter themed tapes present the problem glitter flaking off, but you won’t get that with Ninico. It is not very versatile. Ieebee Foil-Washi tape is based on the use of ordinary pattern printing incorporating bronzing technology, making the pattern metallic in texture. It comes with 21 rolls in each pack and has dimensions of 15mm in width and 4m in length. With a variety of designs, the Ieebee can be used for DIY crafts and dcor. It has a rainbow of vivid colors that will enable you to create a kaleidoscope of playful colors in your home! There’s a whole spectrum of exquisite jewel tones that gleam like precious gems, including shimmering mermaid greens, rich glistening purples and lustrous gold. You can turn your decor into items worthy of Eldorado. Its metallic function makes it more durable. Its vibrant colors make for some of the best dcor as far as Washi tape is concerned. It is waterproof and can be used to protect items susceptible to water damage. It’s not very adhesive, so it won’t stick well on certain surfaces. It is not easily repositioned in the event that the need to do so arises. This Ieebee Washi product comes with a variety of assorted colors and patterns that can be used for DIY craft projects, Gift wrapping and decorations. It comes with 40 rolls of Washi Tape each with a width of 0.3 inch and a length of 13ft per roll. 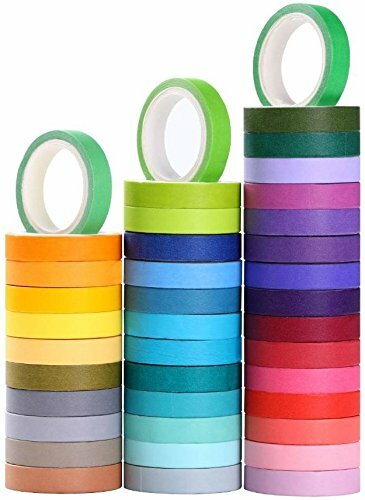 With a rainbow color set, red, orange, yellow, green, blue, purple and more, the Ieebee Color Mix Washi Tape can pretty up anything, plain vases, ceramics, glass jars, pencil pots etc. It is suitable for adults and children alike with an assurance of quality delivered to you in Washi Tape goodness. They are not very glossy, so you can write on them easily. The multiple colors widen the decorative options and variety. They are versatile; you can use them on multiple surfaces with ease. They are adhesive and will stick very well. They aren’t very durable making them useful for mostly short term decoration. They don’t reposition very well. 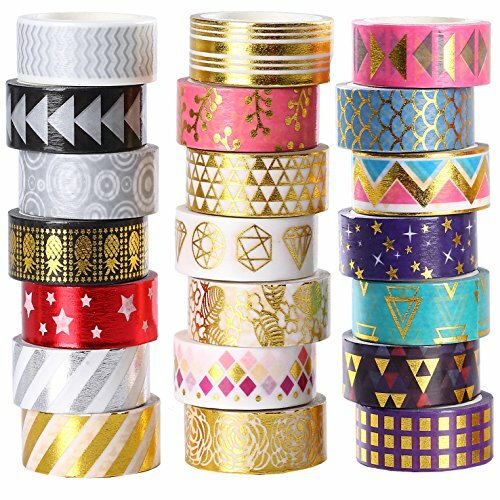 Agutape Washi Tape comes with 48 Rolls of foil gold skinny decorative masking tape. 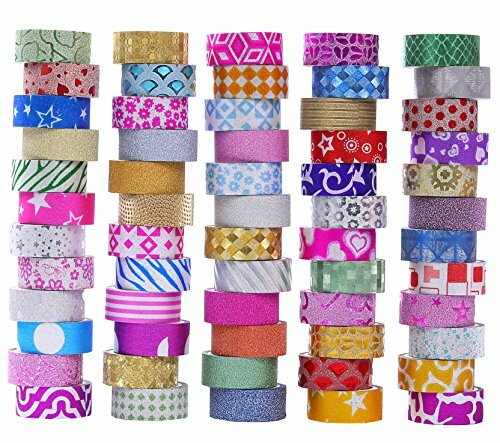 These decorative tapes are perfect for adding splashes of color to back to school gear, stationary, diaries, planners and more. All 48 rolls come in fashionable designs for both Kids and Adults. Each roll has dimensions of 3mm in width and 5m in length. This Masking Tape is a decorative tape from Japan but this amazing super slim tapes are designed by creative US designers. Its super slim design makes for a great planner accessory for adding color, personalization and organization to your weekly planner spread or edges to personalize a planning journal or scrapbook. When used for their intended purpose, the tape is versatile. It’s not designed for walls and other surfaces but it does wonders with books and Journals. It has great adhesive qualities within its sphere of use(Books, Journals). It leaves no residue and can be easily repositioned. It’s not glossy, you can easily write on them. There are quite a number of benefits available for would be users and users of Washi paper alike. For starters it has many creative applications. Washi is one of those products that is not limited to the prescribed way of using it, but allow you to be as creative as you can. Many people are already demonstrating their creativity on platforms like YouTube every day. It helps brighten dark places like insulations, cracks on walls, ill decorated journals and books. With Washi you can add color and style to your dcor. It is multifunctional, it will be useful in many areas ranging from DIY crafts to gift cards. You also get the best when it comes to gift wrapping. And finally among many other benefits is that Washi is fun to use. You will not only get things done but you will also have fun doing it. So if you aren’t already using it, then try it. Ultimately it depends on which Washi tape you get and also for what use. Some Washi tape are designed for surfaces like journals only and so if used on other surfaces like walls, you’ll think they aren’t adhesive. Q.Where can I get Washi Tape? Q.What’s the difference between Washi and regular Masking Tape? The main difference lies in beauty and in that regard washi stands out. I Think when it comes to Washi, you just have to know which one in particular works for you according to your need. If you do that you will appreciate Washi Tape. It is worth your money, very affordable and very useful especially when used correctly. I recommend therefore that you try it out.